Tri-Village Patriots baseball coach Jim Maples gives instructions to his players in team’s win over the Bethel Bees. The Patriots Cole Shroyer swipes second in Tri-Village’s win over Bethel. Cody Eyer knocks a hit for the Tri-Village Patriots in win over the Bethel Bees. NEW MADISON – The Tri-Village boys baseball team used a big second inning to jump ahead of Bethel and then strong pitching from Dylan Finkbine and Gage Hileman to earn a 4-1 win over the visiting Bethel Bees. Gage Hileman led off with a double in the second inning and then scored on a groundout by Joseph McCombs. Dylan Finkbine reached on an error and the Cole Shroyer singled in a run. Lemuel Prieto reached on an error as well to score another run to lead 3-0. The Patriots put pressure on the Bees when getting on base swiping a number of bases. TV scored another run in the third aided by another Bethel error. Mason Sullenbarger reached on a single, stole second and third and then scored on a wild throw to third base. Finkbine was good enough to hold off Bethel throwing a 1-hitter on the night throwing in 6-innings with 5 k’s, 2 bb’s and now runs scored. Hileman in relief got the save throwing in the seventh inning giving up 1 earning run, 1 k and 1 bb. The Duo in back to back games with Ansonia and Bethel have combined for just 1 hit. Finkbine has thrown 11 innings giving up just 2 hits, 1 run has 13 k’s and 4 walks. Hileman has 2 saves and in 2 games, has thrown 3 innings with 2 hits giving up 1 run, has 2k’s and 2 walks. The Patriots also have 9 stolen bases in back to back games with Ansonia and Bethel. Tri-Village improves to 3-1 on the year and 2-0 in the Cross County Conference. 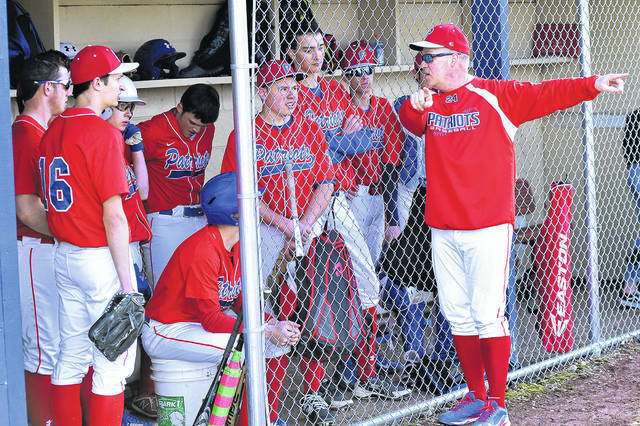 https://www.dailyadvocate.com/wp-content/uploads/sites/34/2019/04/web1_TV-Coach_Jim-Maples-26786-.jpgTri-Village Patriots baseball coach Jim Maples gives instructions to his players in team’s win over the Bethel Bees. 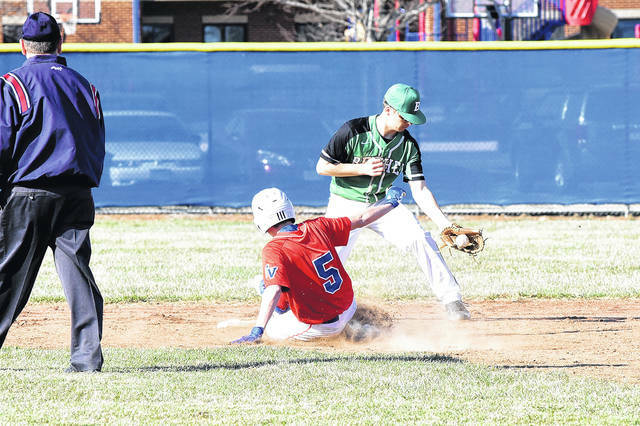 https://www.dailyadvocate.com/wp-content/uploads/sites/34/2019/04/web1_TV-Cole-Shroyer.jpgThe Patriots Cole Shroyer swipes second in Tri-Village’s win over Bethel. 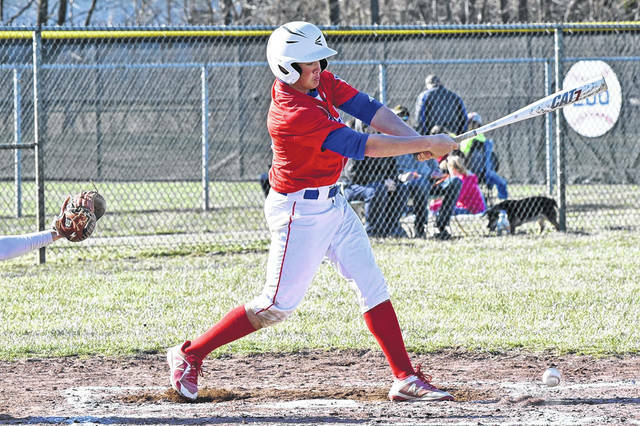 https://www.dailyadvocate.com/wp-content/uploads/sites/34/2019/04/web1_TV-Cody-Eyer.jpgCody Eyer knocks a hit for the Tri-Village Patriots in win over the Bethel Bees.